The Witteveen+Bos Art+Technology Award 2014 will be presented to Dutch sound artist Geert‑Jan Hobijn. Hobijn will receive the award in recognition of his entire body of work. 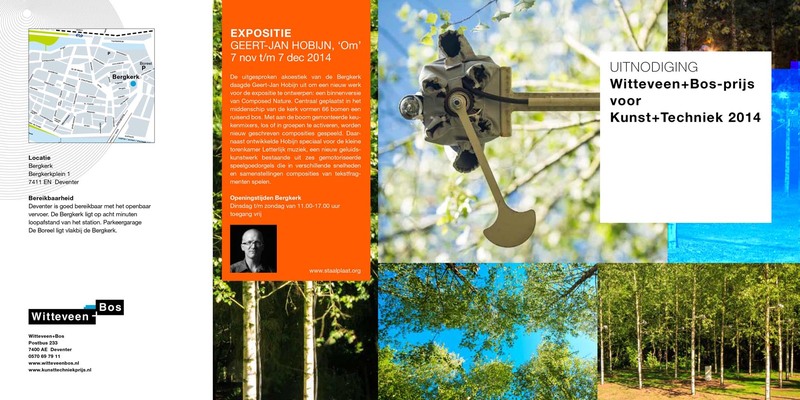 The presentation ceremony will be held on Thursday 6 November 2014 in the Bergkerk Church in Deventer, where Hobijn will also open a new exhibition entitled ‘Om’. Sound artist Geert‑Jan Hobijn was born in Amsterdam in 1959. He gained a degree in fiscal law and studied art at the National Academy for Visual Arts in Amsterdam. In the early 1980s Hobijn set up his own record label Staalplaat, which undertook a range of activities including a radio programme, a record store and a magazine. Around the year 2000 he created Staalplaat Soundsystem so he could focus more on his artistic fascination with sound. Frequently collaborating with others, Hobijn uses this platform to work on a wide variety of sound‑related projects, including ‘mechanical orchestras’ that make use of various consumer electronics appliances. Hobijn is very open about the underlying mechanics and structure of his installations, believing that people will embrace the experience more easily when they know the origin of the sounds. The high level of interactivity and the visible mechanisms have proven to be very appealing to children. In 2005, Hobijn therefore began to give instrument‑building workshops specifically aimed at this target group. The independent jury – consisting of Olof van Winden (chairman, founder of the TodaysArt Festival), Alex Adriaansens (director of the V2_Institute for the Unstable Media in Rotterdam), Joost Rekveld (visual artist), and Margriet Schavemaker (head of collections at Stedelijk Museum Amsterdam) – unanimously praised Hobijn’s ability to touch people’s hearts with his interactive installations. ‘Hobijn perceives everyday sounds not as random noise, but as possible elements for a musical composition. He employs a different distinction between noise, sound and music than most people do, and is endlessly curious about the possibilities of sound and its impact on the surroundings. His works are playful gifts to the communities that he works in and collaborates with. In an era when the gap between art and society can sometimes seem unbridgeable, artists like Geert‑Jan Hobijn can truly make a difference. The jury wants to honour him for the consistent contribution he has made over the years to the contemporary cultural landscape and the marriage of art and technology,’ said jury chairman Olof van Winden. Hobijn will create an indoor version of his work ‘Composed Nature’ inside the Bergkerk Church as part of the exhibition ‘Om’, which is being organised to mark the Art+Technology Award 2014. Sixty‑six trees will be placed in the centre of the church, and the rustling sounds emitted by this ‘forest’ will be used to perform specially composed pieces of music. Hobijn will also create a new work entitled ‘Letterlijk Muziek’ (‘Literal Music’), specifically for the small turret room. The exhibition will be open to the public from 7 November to 7 December 2014 at the Bergkerk Church in Deventer.